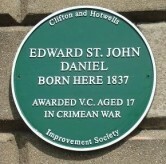 Edward St John Daniel was buried in Grave No. 851, Block 27, Hokitika Cemetery, on 21st May 1868. Whatever marker may have been placed on the grave at the time has not survived. In July 1971, concern was expressed over the overgrown state of Daniel's unmarked grave in Hokitika Municipal Cemetery. As a result, the Hokitika-Westland branch of the NZ Returned Services Association (equivalent to the British Legion) made representations to the local Borough Council. The grave lay in a remote part of the cemetery that was due to be bulldozed and closed off, being very close to an eroding cliff. EDWARD ST JOHN DANIEL V.C. The area around Daniel's actual grave (still unmarked) has now been redeveloped as a park and car park. 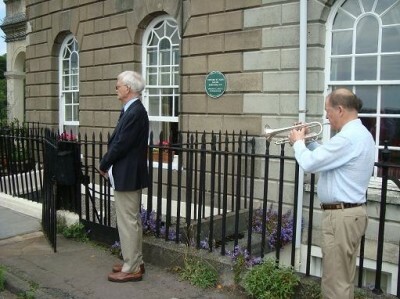 On 4th June 2011, a commemorative plaque, commissioned by the Clifton and Hotwells Improvement Society (CHIS), was unveiled in a ceremony at Daniel's family home, 1 Windsor Terrace, Clifton, Bristol, by Christopher St John H. Daniel, a grandnephew of Edward St John Daniel.